I love those boots! Great rendition! thrifty never looked this fabulous! alloy, you are a true fashion find. LOVE! I'll take the $42 ones in a heartbeat! They look the same! Beautiful! Especially since that heel is so iconic of Marant, I'd despaired of finding anything similar to these or to her Bardu boots! Ahhh the coveted IM's. The steal is a great comparable! Def the Alloy pair- love the studs! I die for those boots. I'm going to definitely go for the more affordable ones, but both of them are gorge. Really cute, the Alloy ones look more comfortable as well! For such a huge price difference, MUST go with the Alloys! You have the greatest finds, lady! I think I actually like the Alloy ones more! At least for my footsies, they would look gorgeous. Love! They are exactly the same! But I love the gray. Much more my style. nice! they both look good! Alloy looks much more stable! These boots are SO FIERCE. If I owned any of them (most likely the cheaper one because while $1 295 IS very affordable...), I'd feel like a rock n' roll girl all the time. I love the Isable Marrent ones, but hate the Alloy ones. I honestly can't tell the difference between them from the photos. I'm sure the Isabel Marant are made of luxurious suede, while the Alloy weigh less than a few ounces because of the material, they really do look the same to me. gorgeous boots! i love them! $42 is a great price for those shoes. They're totally gorgeous. Hello studs! I'm obsessed. These look exactly alike and I'd definitely go for the Alloy pair. I can totally picture these on my feet this fall! I'd save up and get the Marants! I do like Alloy stuff. These are so cool. The Isabel Marant ones for sure!!! I know they're a bit (a lot) more expensive, but I would wear them so much that they'd be worth it. i actually like the heel of the alloy ones better so i'd be thrifty! I remember loving those shoes! I'd be a tightwad today and go for the Alloy ones. Whoa. Not my style, but they're damn near identical! call me naive, but I like the alloy ones better!!! I don't usually wear studs BUT these beauts are wonderful! I love the pointy toes! I sort of forgot how much I obsessed with the Isabel Marant version months ago... oh what a steal the others are! If I give you my mailing address, will you send me a pair of the ones on the left please hun? I was so excited today, I received the giveaway book, The day I shot cupid by j. hewitt. Thank you so much. I will be posting about it tomorrow. This shoe had to be inspired a little from Desperately Seeking Susan..one of my favorite movies. But such a modern heel. I'd definitely go with Alloy. I do enjoy their stuff. The Alloy price is so much more affordable. one thing i love about fall is it's boots season! this is very cute! Am I crazy--I like the Alloy version better! I don't know how you do it every week but your shopping tips just keep getting better! Hope you're having a great week so far Erika! 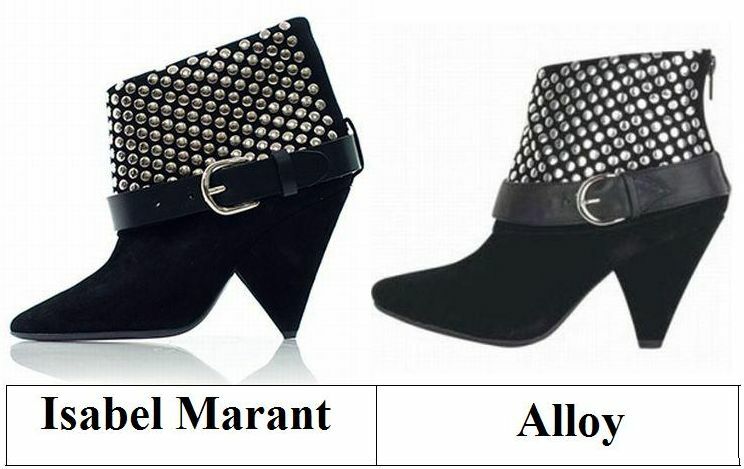 This time I have to choose Isabel Marant. I love her designs. alloy is amazing! delias too!! isnt it funny how people worry so much about a label? they look exactly the same! I saw the Isabel boots in person where I work.. her stuff is seriously amazing!! The alloy knockoff isn't bad either! Wow! Those Isabel Marant booties are expensive!! I'll take the Alloy pair! Oh my gosh! I just love the detailing on these boots! What a great steal. I even love the zipper on the Alloy knockoff, I totally think the Alloy's are cuter anyway and their price just makes them so much better! I will definitely be purchasing them in gray. I cannot wait to add these beautiful boots to my shoe collection. I love these booties. They look exactly the same great find!! I asked my sister what do you think about these shoes and she said they're horrible,And i told her than you don't know about fashion because honey these are beautiful.I absolutely love them.I was checking this blog and its one of my inspirations.for my blog. Buying on the web or in-store? which usually do you realy go for? actually wondering lol.. i favor in-store only because i hate waiting for it to arrive! Thanks for this awesome post. Fashion doesn't look completed without shoes. Your product will look lovely with glittering wears.